Sustainable development was a mandatory constraint of London 2012 Olympic Games and Paralympic Games, since the original bid in 2007. In the bid a promise was made that London would be the ‘most sustainable Games ever’ with an independent monitor commission. This effort has become even more important due to the criticisms on the sustainability front of the Beijing’s Games- thousands of people were displaced to build the Olympic Park, while the smog, algae, choking traffic and alarming increase in demand for energy were all pointing to an environmental disaster, until late serious counter-actions were taken with over $16.4 billion in environmental infrastructure for the Olympics, saving a reported 1.2 million to 1.5 million metric tons of carbon dioxide emissions. The effort to take a huge event like Olympic Games, with a plenty of people conveyed in a busy large town for a very short timeframe, and seriously reduce its footprint compared with the past editions is daunting. The organizing committee must take decisions on how suppliers and sponsorship partners are chosen, to promote appropriate training and long term employment opportunities and tackle global issues such as climate change. Sustainable development means: “making the most out of the social, economic and environmental benefits that will come with hosting such a major sporting and cultural event and creating a positive legacy for the future”. •· The governance, planning, information gathering and reporting processes Assuring a Legacy: The Sustainable Development Assurance Framework for the London 2012 Games Programme]. A review of the approach taken to carbon measurement and management across the London 2012 programme Extinguishing Emissions? 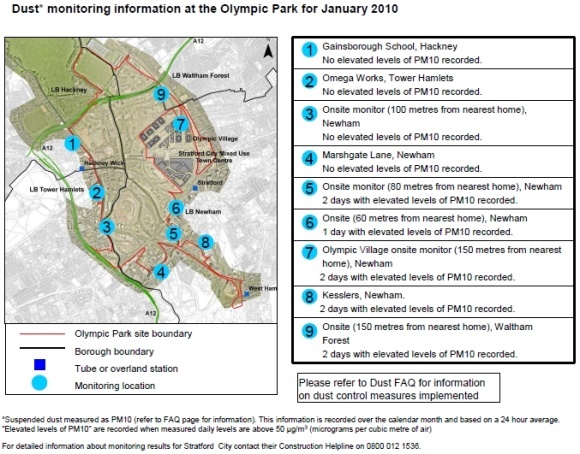 such as this example of ICT usage for their monthly dust and noise environmental monitoring reports. I think that many other events like Universal EXPO (Shanghai EXPO 2010, Yeosu Expo 2012 , Milan EXPO 2015) since they are all related to sustainable related topics such as “Better City Better Life” “The Living Ocean” and “Feeding the Planet, Energy for Life”.